A dazzling, attractive smile conveys confidence and strength. As we age, teeth naturally darken. This is due to the fact that teeth are porous. Thus, over time teeth will stain. Red wine, strawberries, coffee, tea, and anything that will stain a white shirt will slowly stain your teeth. One of the most common ways to improve your smile and enhance your appearance is with teeth bleaching. However, the more correct term is teeth whitening as there is no bleach used in the whitening process. 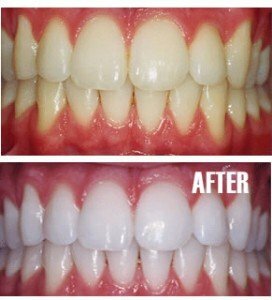 Teeth whitening removes stains and discolorations from teeth. Research and clinical studies show that teeth whitening with carbamide peroxide and/or hydrogen peroxide is safe for both teeth and gum tissue. Dr. Nugent uses take home whitening trays at his office to get patients to their optimal teeth whiteness. What options does Dr. Nugent offer for teeth whitening? Dr. Nugent uses laboratory made take home bleaching kits. These at home kits will get you to your optimal whiteness. You may have heard of laser teeth whitening or ZOOM whitening. These laser systems (by the way, the laser does nothing to help with whiteness) use extremely high peroxide levels to initially remove stain. This is painful to the patient. Furthermore, to achieve optimal teeth whiteness at home trays are still needed after laser in office Zoom whitening. The Zoom whitening is a lot more expensive because you are paying for the office time to have someone bleach you for an hour. The laboratory made home bleaching kits are a bargain compared to Zoom in office whitening. Absolutely! 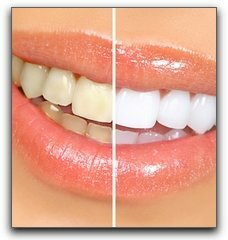 Pasadena, Texas Dentist Dr. Nugent loves to make his patients teeth whiter with a simple at home bleaching system. The take home bleaching kit is the biggest cosmetic bang for your buck. Professional at home teeth whitening can safely and effectively stains and renew your smile. Drug store whitening kits simply do not have the strength that professional dental grade whitening kits from Dr. Nugent. Furthermore, because drug store bleaching kits are a generic size they do not fit as precise as Dr. Nugent’s bleaching trays. Therefore, the bleaching solution gets on the gum tissue and burns the gum tissue. No. In some cases the teeth were stained during development. Teeth bleaching will not work. Dr. Nugent will recommend other alternatives, like porcelain veneers or cosmetic crowns, if teeth whitening can alter the shade of your teeth. Yes. Teeth whitening is very safe and provides a great service to patients. A white dazzling smile can increase self-confidence. Call our office today at 713-941-8261 and discover how teeth whitening can give you a beautiful white smile. Our office is conveniently located at 3421 Burke Rd Ste A, Pasadena, Texas 77504.